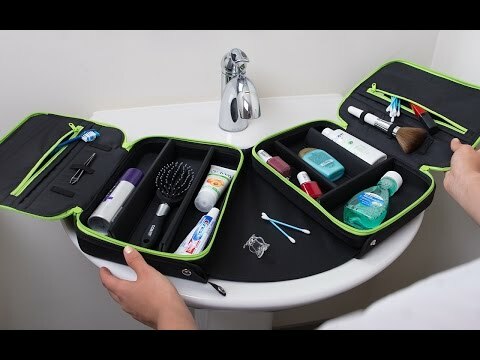 More than an expandable cosmetic case, this organizer has features that help you keep track of everything whether you’re traveling or at home. Customize the compartments to meet your needs, then unsnap and slide them into a surface area that fits seamlessly over your sink. Use it to store makeup, toiletries, craft supplies, camping essentials, or to keep your stuff separate in a shared bathroom. Dimensions: Closed: 15" x 10.75" x 2"; Expanded: 22" x 10.75" x 2"; Fully Expanded: 36" x 10.75" x 2"
Keep everything in an 15-inch organizer that unpacks to three feet of storage.